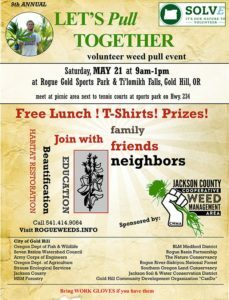 Let’s Pull Together is a weed pulling event hosted in towns across the west coast from Alaska to California. Join Josephine and Jackson County neighbors for this annual event to help protect some of our most special places from invasive plants. Participants receive a commemorative t-shirt, enjoy a BBQ lunch and raffle prizes!! Directions: From Gold Hill, travel upstream (north) approx. 0.6 mile on Highway 234. At milepost 3, turn right into Sports Park, follow signs, meet at picnic area near tennis courts. Work area will be along river between sports park and falls.